Every time a new journal or small press launches, it is a major event for literature; every time one closes, it is a disaster. It is a rare person who will affirm that things in English-language publishing are exactly as they should be. The #readwomen 2014 campaign emphasized the scandalous gender bias in publishing, promotion, and reviewing; the translation database at Three Percent tracks abysmal figures for foreign fiction in translation; and anecdotally, anyone who has dealt with large publishers cannot help but lose heart at their willingness to lose millions on lavish advances for famous has-beens while refusing the relatively minor risk of publishing foreign writers of great stature. The situation is hardly better with journals and magazines. While a cornucopia of poorly funded, university-based journals offers prospective writers and translators next-to-no visibility, more famous outlets, many of which state in their masthead a willingness to publish the new, the daring, and the uncategorizable, go on cranking out one mind-numbing workshop story after another. Then, up in the ether, are the Atlantic, the New Yorker, the Paris Review, and their ilk, at the gates of which the translator clamors like poor K. before the portal of Kafka’s castle. Nietzsche famously remarked that the Renaissance was raised on the shoulders of a hundred men. The good literature that makes it into English, especially the literature from other countries, does so thanks to the efforts of far fewer. Every time a new journal or small press launches, it is a major event for literature; every time one closes, it is a disaster. When an unknown writer becomes a sensation, there is often the sense that he or she comes out of nowhere, but this is rarely the case: Krasznahorkai has been writing since the eighties, Elena Ferrante since the nineties, but only now are they getting their due in English. When recognition comes, it is usually the result of long, thankless, unpaid promotion on the part of writers, translators, editors, and other advocates. 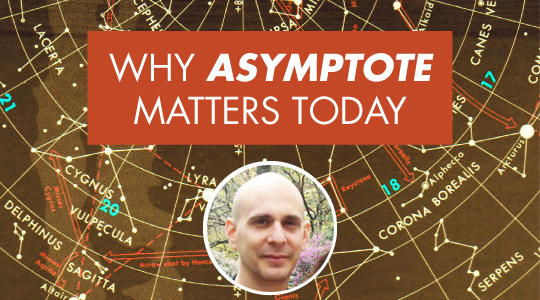 Journals like Asymptote are essential to this process: spaces where established voices don’t crowd out newcomers, but where rigorous criteria ensure that the goods on offer are more than mere fluff. A particular advantage at Asymptote is the multitude of different voices who have input over the content; in many cases, these people are based where the authors translated reside, and can judge not only the work’s importance but the fidelity of the translation in question. Asymptote helps provide a bridge between obscurity and the commercial publications that are necessary if foreign literature is to have an impact outside of a tiny circle of initiates. These authors have to make it into print, but publishers can rarely find them on their own, and when a translator sends a sample with a query letter, the risk is high that it will get thrown onto a slush pile alongside My Little Pony fan fiction and the memoirs of 9/11 conspiracy theorists. I say this from experience, because Asymptote has helped to get a number of the authors I translate into print. When I began translating Josef Winkler, he was virtually unknown—the two books translated by him in the mid-1990s hadn’t received a single review. Shortly after publishing an essay on his works and a short translation of his novelette Natura Morta in Asymptote, I found a publisher for his works, which have since been reviewed in the Guardian and the TLS. Pere Gimferrer, arguably the greatest living poet in Spanish and Catalan, was similarly unknown in English when I published an excerpt of his novel Fortuny in Asymptote in January, 2013; that novel is forthcoming from David R. Godine, and I also published a translation of his poem Alma Venus with Antilever in June of last year. As I write, I am in negotiations for two other books by two authors I wrote about and translated for Asymptote, Marianne Fritz and Jean Améry. Asymptote is free. Neither the editors, nor the translators, nor the authors are paid. In an ideal world, it would be otherwise, but the preponderance of free content on the internet would make a subscription model harmful to the already beleaguered authors Asymptote is trying to make better known. This does not mean it is free to produce. Hopefully these words about the importance of the journal to the writers and translators it has presented to the world will encourage you to contribute to its survival.